Westies have particularly sensitive stomachs. Learn more and make sure you're feeding them right to fend off potential health threats. West Highland White Terriers are small, white dogs originally bred in Scotland for hunting, but today, they mostly earn their keep as loyal little companions. 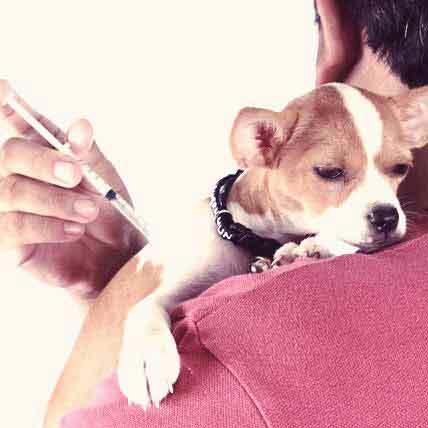 Members of this breed suffer more frequently than most other breeds from a sensitive stomach, food allergies and diabetes, and feeding choices can help with these issues. Some Westies may do best on a hypoallergenic food, especially one that contains hydrolyzed protein. To keep your dog healthy and to help or prevent some health conditions that may affect Westies, make sure you feed this small, active dog high-quality food in the appropriate amounts. The amount of dry dog food you feed your West Highland White Terrier is based on the dog's weight and the calorie content of the food. Typically, an adult Westie weighs between 16 and 20 pounds. Feed the correct amount of food to your dog according to the manufacturer's directions listed on the food packaging by weight. Weigh your Westie using a baby or pet scale, or you can have your veterinarian weigh your dog. Active Westies, such as those that compete in agility competitions, need more calories per day. Active dogs who are the approximate size of the Westie require about 700 kilocalories of food each day, while inactive dogs of the same size need about 450 kilocalories. Some dog food manufacturers print calories-per-unit-measure information near the ingredients list on the packaging. For others, you may have to call a helpline number printed on the packaging to ask for the information. Small adult dogs of Westie size require approximately 4 to 6 ounces of dry dog food daily. This varies according to the ingredients in the food, so check the specific brand of food you plan to feed your Westie. Additionally, make sure your Westie's diet is divided into at least two meals a day, as smaller meals help digestion. Feed your Westie the correct portion of canned food, based on the dog's weight, following the manufacturer's directions. Typically, about one to two cans of wet food per day, divided into two or more meals, is appropriate for a small breed like the Westie; actual amounts depend on the brand. When feeding canned dog food, leave the food with the dog for no more than 20 minutes, then refrigerate any leftovers to prevent spoilage. 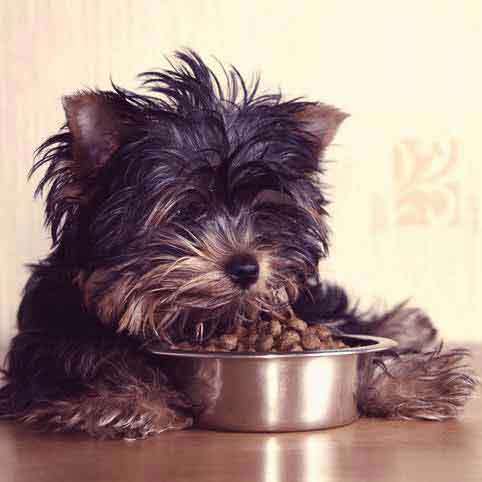 Whether you are feeding canned or dry food, divide the manufacturer's recommended daily amounts for your dog into two to three meals, given at least a few hours apart. This prevents an overloading of your Westie's digestive system. Dividing the food is also important because, with their sensitive stomachs, this breed may vomit on an empty stomach. Feed your Westie a nutritionally balanced food that contains ingredients approved by the Association of American Feed Control Officials to ensure it is nutritionally balanced for your dog. 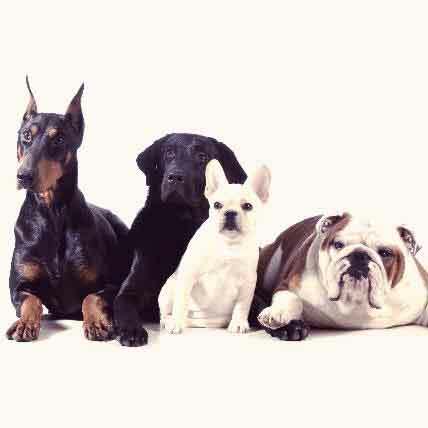 The first listed ingredient of a high-quality dog food should be a meat protein such as fish, chicken, beef, or lamb. By-products and grain fillers like corn and wheat shouldn't be a primary ingredient as these are not easily digestible and can cause stomach upset to breeds with sensitive stomachs like the Westie. Premium pet foods contain fewer of these hard-to-digest ingredients. Choose foods based on your dog's age; for dogs over 7 years old, you can purchase age-specific foods that contain fewer calories and more fiber. If you want to prevent staining of the white fur around the Westie's mouth, avoid foods that contain food coloring. Westies can suffer from atopic dermatitis and allergies, according to the Westie Foundation of America. 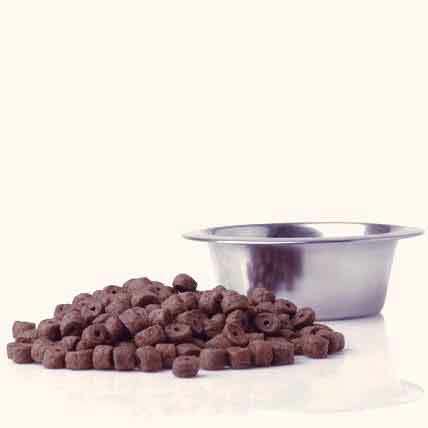 Some dog food manufacturers offer special foods to help address food allergies. Consult your veterinarian about food choices that may help your allergy-prone Westie. Fatty acid supplements, such as those that contain evening primrose and fish oil, can help soothe dry, itchy skin. Consult your veterinarian before adding supplements to your dog's normal ration. Follow the manufacturers' recommendations on specific amounts to use. 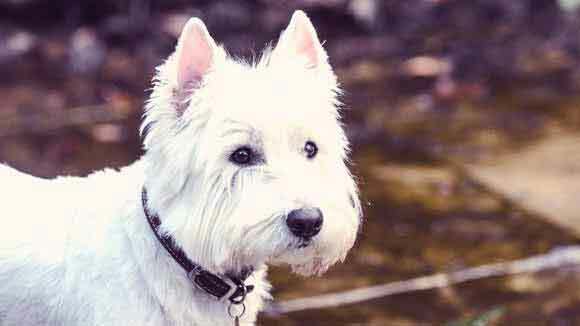 Some Westies are susceptible to liver disease due to an inherited inability to excrete copper, leading to copper toxicosis. If your Westie suffers from this disease, your veterinarian may recommend a low-copper diet and zinc supplements to help absorb excess copper. Westies are also prone to diabetes, so it is important to monitor your dog's weight to ensure the dog doesn't become overweight. Don't overfeed your dog, and go easy on those treats. Consult your veterinarian if you can't easily feel your dog's ribs, as this is a sign that your Westie is overweight. To address the obesity issue, cut your dog's feed a bit and increase the exercise program, or switch your older, more sedentary Westie to a lower-calorie formula or one that contains more fiber. Westies have powerful jaws. They should not be given rawhide or pig ears to chew, because such objects can splinter into smaller pieces that can get lodged in the dog's intestine. 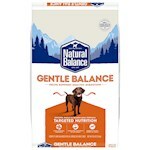 What are Hypoalllergenic Dog Foods and Novel Protein Diets?